What do you see when you first walk into your office? Does the uncluttered arrangement emphasize your sparkling floors? Would you feel prepared if a high-spending client walked through your door? Your clients' first impressions start long before you say hello. Start every meeting off on the right foot with office cleaning in Mississauga. We know that cleaning crises don't follow a 9 to 5 schedule. Call us any time to take advantage of our 24/7 emergency cleaning services in Mississauga. You can reach us at 905-502-0813, or, fill out our online form for a free quote. Click through our services to learn more about what we can do to help your business. 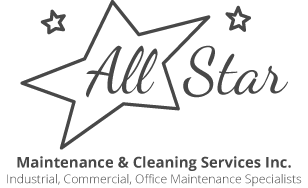 Do you want to share your experience with All Star Maintenance?